You are currently browsing the Bookmobile News weblog archives for September, 2012. The Free Bookmobile strikes again! As part of our Innovation Grant work with Impact100 Sonoma, we have begun installing additional Neighborhood Libraries throughout the Valley region, especially at locations which serve low-income and other access-challenged families and individuals. This past Tuesday we first visited the Sonoma Overnight Support HAVEN shelter, which offers resources and a safe place to live while people get back on their feet. The shelter had some older adult books but very little for other age groups. We provided fresh titles in both English and Spanish for toddlers, early readers, middle-levelers, teens and adults, all nicely organized by age/level. Wishing these families lots of love with their new bedtime stories! Our second stop was at the Sonoma Valley Community Health Center, where we had set up a lending library back in March. Their shelves were half-empty and the toddler box was completely missing! Fortunately we had plenty of high-quality replacements for them on board, including a new box of board and picture books for their little ones. We finished the day at La Luz Center, which provides English language training, teaches computer skills, distributes food, hosts medical services, offers crisis counseling, and supports events that celebrate the richness of our multicultural community. Their English-language learners were on hand to board the Free Bookmobile and choose books to take home. Afterward it was our pleasure to fill their entire wish list of types of books that will support their non-profit mission, including a language reference set and beautiful new titles in Spanish for adults generously donated by Amber-Allen Publishing. We also left them with a big floor-box of multi-cultural beginner books for little hands. La Luz staff will now be promoting our ongoing monthly visits to Boyes Hot Springs (at the Fiesta Center) so that their patrons can take better advantage of our outreach, and we look forward to serving them again at their facility in November! Thank you, Finley Foundation! 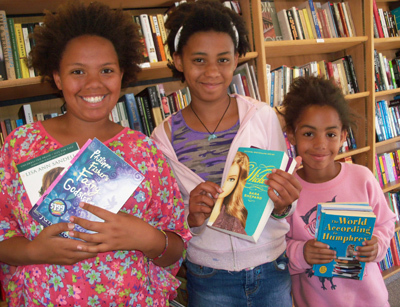 The Ernest L. and Ruth W. Finley Foundation Board of Directors have made a supportive grant to the Free Bookmobile, as well as to our sister organization, the Sonoma County Book Festival. For decades now, Finley funding has made a huge impact on opportunities for citizens throughout our community, such as at the beautiful Finley Aquatic Center, and we are thrilled to join the family of projects they support. Wow, what a donation! Our good friends at Amber-Allen Publishing just blessed us with thousands of dollars worth of their spiritual and personal growth books & audio! These titles, such as Don Miguel Ruiz’s The Four Agreements, have been extremely popular thus far and we are especially excited to get a broad variety of their new material in Spanish language, and on audio for our vision-impaired patrons. Thank you, Amber-Allen, for this tremendous investment in the quality of our service! We are very pleased to offer a new website gallery with scenes from our summer adventures. Make your way to http://freebookmobile.org and click on “Photos” then “2012″. The latest album is on the right. We are especially proud of the new paint job on the Free Bookmobile. More shots of the vehicle’s new look, plus the very latest news, are available on our Facebook page at http://www.facebook.com/freebookmobile (click on “Photos”).